The JTX Cyclo-Go Home exercise bike is a pretty good-looking machine for a budget at-home bike. There is a nice shape to the moulded casing and frame. 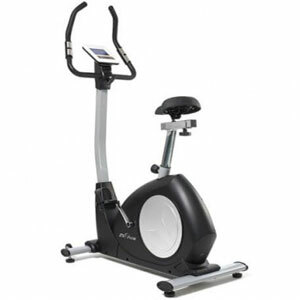 It has a one-piece, sturdy look compared to other portable exercise bikes. Some buyers will come for the design of this bike – which also includes a fancy colour touchscreen display – but hopefully they will stay for the workout. Does this model provide the settings and intensity that buyers need? 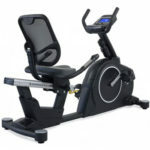 Most users are impressed with the options available with this JTX Cyclo-Go Home exercise bike. There are a lot of positive comments for this JTX fitness bike that focus on the hardware and general build quality. Many are impressed with the sturdy feel of the machine, which shows that this isn’t all about looks. Others mention the lack of noise and the smooth motion. These features are down to the electro-magnetic resistance and 11kg flywheel. These advantages allow users to workout with a little more confidence for longer periods. They can test their limits on the different programmes – in front of the TV – without any fear of the bike machine getting too wobbly. There are 21 programmes in total, all accessible from that fancy console. This includes interval and fat burning options. The quick start buttons should also provide a greater sense of user control. This sense of control, combined with the low-impact approach, is important for those working on injuries and fitness goals. This control continues with the option of four customised training programmes. Some would argue that the features and settings of this JTX home exercise bike don’t go far enough. There are some users that mark this gym bike down a star in their reviews because they see it as more of a “general” bike for newcomers. This suggests that it didn’t have the programmes or intensity that they were looking for. There is also a comment about the quality of the material on the seat. It seems that just like the saddles on real bikes, this feature is something of an afterthought. Still, new buyers can’t ignore all the comments about the comfort levels of this stationary bike. It is an over-sized seat and there is the added bonus of the adjustable angle on the handlebars. How does the negative feedback affect the final verdict on this JTX Cyclo-Go at-home bike? There is a definite lack of criticism here that suggests that this bike is a good all-rounder. Those that complain that this is too much of a beginner’s bike have a point. The buyers with the best experiences tend to be people with minimal experience or injuries. Still, these users have a great workout and have lots of features to play with. In the end, the JTX exercise bike is an attractive, interesting machine that will help a lot of people with their at-home workout. Find more reviews about the JTX Cyclo-Go Home Exercise Bike on JTX Fitness here.